THE LADDER is simple to use. It takes what we already know and gives us a language to communicate it. THE LADDER can be used for both laboratory communication and patient education. The LADDER is a reference guide created for dentist-to-ceramist communication of tooth features, other than shade. THE LADDER is a pictorial display of meticulously and painstakingly crafted digital images on laminated archival photographic paper, allowing for multiple reproduction of identical references. These images are categorized, color-coded by category, and encoded for easy reference and clear communication. It is the most accurate and consistent system of images available today– depicting a comprehensive array of translucency, characterizations, surface anatomy, chroma, value, and variations. No longer are you subject to the vagaries of inaccurate color photos, written descriptions, schematic drawings, or the additional costs associated with photography. When you change media, there is always loss. There is no loss of information when using THE LADDER because communication is always 1st generation. These are not simply printed photographic images, but combinations of multiple exposures of respective features that have subsequently been digitally enhanced. Each final image truly displays features as they appear clinically without loss of detail that is inherent with any type of photography. In addition, the quality and character of features exceeds information that may be available using a shade scanner. THE LADDER picks up where scanners leave off. 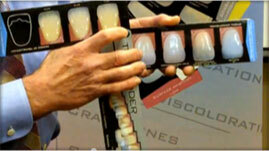 THE LADDER is simple to use and allows the clinician and technician a great deal of latitude in referencing features. If one were to only use the degree of translucency pages, THE LADDER will pay for itself many times over in avoiding esthetic re-makes. Because there are many features depicted in various categories, THE LADDER enables life-like appearances in restorations, especially when the shade is not exact. Using THE LADDER also improves shade-taking by taking the visual confusion out of features that can often be interpreted as a part of shade. The appearance of the desired restoration is prescribed just like it will be fabricated – feature-by-feature.